Condition is very lightly used (barely used at all) with HOYA lens filter & f ront & rear Fujifilmcap s. o r P i c k U p D u l w i c h H i l l.
With a design that could easily have it labelled as the ultimate travel lens the ultimate travel lens the Fuji 27mm weighs under 80 grams, a certified lightweight! Pair this lens with your favourite Fujifilm X-series body to enjoy the lightweight, high-performance qualities that has made this compact system range such a modern classic. Takes stunning photos (as you probably know). Mint never used Fuji film XF 50mm F2 WR. Just been sitting in the box. A fast, linear motor-driven autofocus system will get you to your focus smoothly and quickly and keep you shooting confidently. Fujifilm XF 18-55mm f/2.8-4 R LM OIS Zoom Lens Lens Cap Rear Lens Cap Lens Hood Cloth Wrap 1 Year Fujifilm Australia Warranty. Hardly used, compared to my other lenses. Fujifilm refurbished product. Lens may have signs of use. Nine Month Fujifilm Australia Warranty. - High-torque DC coreless AF motor provides quick, quiet, and precise autofocus performance. FOCUS TYPE: Autofocus. XF 35mm f/2 R WR Lens from. Along with this, it has a fast f/2 maximum aperture, useful for creating images with a shallow depth-of-field and working in low-light conditions. Also, the lens has the Nano-GI coating which dramatically limits the effects of ghosting and flare. Fastest autofocus of 0.08 sec. The lens features a weather- and dust-resistant structure with eight seals on the lens barrel keeping the lens protected from rain, dust and splashes of water when shooting outdoors. 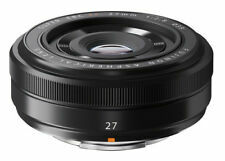 Fujifilm XF 27mm f2.8 lens provides a 55.5° angle of view. Fujinon's HT-EBC lens coating reduces reflections at a wider wavelength and minimizes flares and ghosting. Its minimum focus distance is 34 cm. Along with this, it has a fast f/2 maximum aperture, useful for creating images with a shallow depth-of-field and working in low-light conditions. Also, the lens has the Nano-GI coating which dramatically limits the effects of ghosting and flare. MPN - 74003. A Super EBC coating has also been applied to suppress flare and ghosting when working in bright and backlit conditions. Autofocus AF. Rear Lens Cap for FUJIFILM X-Mount Lenses x 1. 39mm Lens Cap x 1. Fujifilm XF 18-55mm f2.8-4 R LM OIS Zoom Lens. Autofocus: Yes. Focal length: 18 - 55mm. What Lens Upcoming Professional Photographers Use?. Filter Thread: Front: 58 mm. Angle of view: 79.1° - 28.4°. Comparable 35mm Focal Length: 27 - 84 mm. The lens is ideal for portraiture because of its beautiful blur and ultra sharp results. Macro Lens. Bright f2.4 Aperture. Rear Lens Cap for FUJIFILM X-Mount Lenses. Olympus 7-14mm F2.8 Pro Micro Four Thirds Lens. 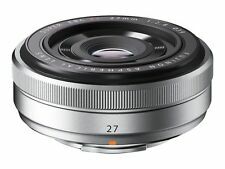 1x Fujinon XF 27mm F/2.8 Lens (Silver). - Fujifilm X Mount. 1x Front Lens Cap. 1x Rear Lens Cap. 1x Lens Wrapping Cloth. 12 Months Warranty Included . Fujifilm Ã Fujinon XF 80mm F2.8 R LM OIS WR Macro Lens. The long focal length coupled with the f/2.8 maximum aperture is well-suited to isolating subject matter, especially when paired with the short 9.8" minimum focusing distance, and a 1:1 life-size magnification is ideal for macro shooting. Benefitting handling and fast-paced shooting, this 90mm f/2 also incorporates a Quad Linear Motor for quick, quiet, and precise autofocus performance. Quad Linear Autofocus Motor. Fujifilm X mount. Super EBC Lens Coatings. Fujifilm FUJINON XF 35mm F2 R WR  Black Lens. Stepping Autofocus Motor. 53mm (35mm Equivalent). D-SLR Lens. Rear Lens Cap. Lens Pouch. Australian based warranties including both labour and part. It's equivalent to 1 year Manufacturer warranty. MPN - 75473. XF 16-55mm f/2.8 R LM WR from. FUJIFILM is a versatile standard zoom spanning a 24-84mm equivalent, wide-angle to portrait-length range. Autofocus Yes. Rear Lens Cap for FUJIFILM X-Mount Lenses x 1. 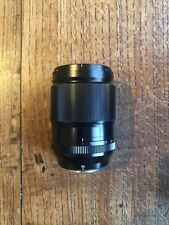 7artisans 50mm f1.1 Manual Lens Black for Leica M Mount. 7artisans 55mm f/1.4 Manual Focus Lens. 7artisans 7.5mm f/2.8 Manual Fisheye Focus Lens. 7artisans 55mm f/1.4 Lens for Fuji X x 1. For Fujifilm FX Mount. Carl Zeiss Touit Planar T 32 mm f/1.8. Lens Body has minor scratches slightly, and the rubber of Zoom ring and Aperture ring part have scuff marks. Accessories:F/R Cap(Front Cap has scuff marks), Original Box, Lens Hood(has scuff marks and scratches). Silver XF 35mm f/2 R WR from. Stepping motor, along with an internal focusing design, affords fast and quiet autofocus performance that benefits both stills and video applications. Rear Lens Cap for Fujifilm X-Mount Lenses x 1. Fujifilm Fujinon XF 90mm f/2 R LM WR Lens. 1x Fujifilm Fujinon XF 90mm f/2 R LM WR Lens. - Quad Linear Autofocus Motor. - Fujifilm X Mount. 1x Front Lens Cap. 1x Rear Lens Cap. 1x Lens Hood. 1x Lens Pouch. An f/2.8 maximum aperture is effective in low light and provides shallow depth of field focus. Fujifilm X Compatibility. Autofocus Yes. A complex floating lens system ensures a uniform length when focusing and provides consistently sharp performance. Product Highlights X-Mount Lens/APS-C Format 27mm (35mm Equivalent) Aperture Range: f/2 to f/16 Two Aspherical Elements Super EBC Coating Rounded 7-Blade Diaphragm . Product Highlights X-Mount Lens/APS-C Format 85mm (35mm Equivalent) Aperture Range: f/1.2 to f/16 One Double-Sided Aspherical Element Two Extra-Low Dispersion Elements Super EBC Coating Internal Focusing Mechanism Rounded 7-Blade Diaphragm . Product Highlights X-Mount Lens/APS-C Format 122mm (35mm Equivalent) Aperture Range: f/2.8 to f/22 One Aspherical Element, Four ED Elements Super EBC Coating Linear AF Motor, Floating Focus System 1:1 Magnification, 9.8" Minimum Focus Optical Image Stabilization Weather-Sealed Design, Fluorine Coating Rounded 9-Blade Diaphragm . Product Highlights X-Mount Lens/APS-C Format 35mm (35mm Equivalent) Aperture Range: f/1.4 to f/16 One Aspherical Element Super EBC Coating Rounded 7-Blade Diaphragm . For pinpointing your preferred focal point and rendering the remainder of your image into a non-distracting blur, this lens features a bright f2.4 maximum aperture. Another benefit of this large aperture is the handheld shooting ability that it brings to the lens. Will provide original receipt (warranty goes to November 2019). With a maximum aperture of f/2.8, it performs well in low light and is ideal for general use. Pickup also available in Castle Hill/Kellyville area or Wynyard in Sydney CBD. Fujifilm X mount. Front Lens Cap. Rear Lens Cap. Diaphragm Blades. CANCELLATION POLICY. LOST PARCEL AND DISPUTE CASES. Zeiss ZEISS Touit 32mm f/1.8 Aspherical AF MF Lens. For Fujifilm X Mount. Designed for the bokeh enthusiast, theFUJIFILM XF 56mm f/1.2 R APD features a unique optical design, flattering portrait-length field of view, and an especially fast f/1.2 maximum aperture. Differentiating itself from FUJIFILM's other XF 56mm f/1.2 lens, this APD version incorporates an apodization filter to produce an aesthetically-pleasing out-of-focus quality to suit selective focus applications. Fujifilm XF 27mm F2.8 - Black NEARLY BRAND NEW! Optical is really clean, lense functions perfectly. 5 out of 5 stars - Fujifilm XF 27mm F2.8 - Black NEARLY BRAND NEW! 8 product ratings8 product ratings - Fujifilm XF 27mm F2.8 - Black NEARLY BRAND NEW! Fujifilm  FUJINON XF 90mm F2 R LM WR Lens. Quad Linear Autofocus Motor. D-SLR Lens. Rear Lens Cap. Lens Pouch. Australian based warranties including both labour and part. It's equivalent to 1 year Manufacturer warranty. Australian based warranties including both labour and part. It's equivalent to 1 year Manufacturer warranty 2. What you see is what you paid 5. Differentiating itself from Fujifilm's other X-series 56mm f/1.2 lens. 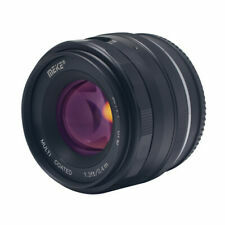 1 x Fujifilm XF 35mm f/2 R WR Lens (Black). 1 x Rear Lens Cap for Fujifilm X-Mount Lenses. Autofocus Yes. Along with this, it has a fast f/2 maximum aperture, useful for creating images with a shallow depth-of-field and working in low-light conditions. Series Fujifilm XF. Model XF 35mm f1.4. Mount Fujifilm X. KODAK LENS. CANON LENS. SAMSUNG LENS. NIKON LENS. CASIO LENS. Minlmum Focusing Distance : 0.4m. 4, Human landscape micro single lens: 35mm focal length wide-angle lens has a small wide-angle view, is also the closest to the human eye to see the angle of view, easy to use. Lens model is Minolta MC Rokkor-PF 50mm f1.4 lens, SN 5038312. It is all manual lenses, you will have to focus and adjust aperture manually. Mount Fujifilm X. Series Minolta MC. Product Line Minolta MC. 1 x Rear Lens Cap for Fujifilm X-Mount Lenses. Autofocus Yes. Baby & Kids Accessory. Focal Length 50mm. Pet Accessory. Sports Accessory. 1 x Front Lens Cap. Cell phone & Accessories. "Lensbaby SOL 45" is a full-size compatible manual focus lens that pursues compactness while having tilt function, compatibility of ease of use and creative effect. The tilt angle is 8.5 ° and you can move the area where the mark is in focus to anywhere in the screen. Zhongyi Mitakon Speedmaster 35mm f/0.95 Mark 2 for Fujifilm XF X-Pro2 X-T1 X-E2 (Black) Zhongyi Optics (ZY Optics) has released an improved version of their first f/0.95 lens, Zhongyi Mitakon Speedmaster 35mm f/0.95 Mark II. The mark II verison features a drastic improvement of sharpness, better control of chromatic abberations and much compact size. The new version comes with a Fuji X / Sony E / EOS-M mount and is able to cover the image circle of APS-C sized sensors. . Product model: Fujinon XF35mmF2 R WR. Lens type: fixed lenses. Type: standard lens. Lens mount: Fuji Film X. Color: Silver. (Wide-angle) focal length: 35 mm. Product weight: 168 g.
By A Circular Nine Aperture Blades, Creating A Smooth Circular Blur. In Addition, To Achieve A Pre-Blur And Rear Blur Together Beautiful Blur By Suppressing The Spherical Aberration To The Limit. â—† By Combining The Corresponding To The Quiet Auto-Focus Phase Difference Af With High-Speed, High-Precision "X Series" Body And The Lens, You Can Comfortably Shoot At A High-Speed Af That The Fastest 0.06 Seconds. Fujifilm Super EBC XF 23mm f/1.4 R Fujinon Aspherical Lens. Type Aspherical. Series Fujifilm XF. Mount Fujifilm X. Model 23mm f/1.4 R. Focal Length 23mm. KODAK LENS. CANON LENS.